Austin Dillon won the second heat race for the Fitzgerald Glider Kits 300 at Bristol Motor Speedway. The race was caution free and Dillon led every lap. Ty Dillon was second, followed by: Joey Logano, Daniel Suarez, Kevin Harvick, Aric Almirola, Jeb Burton, Blake Koch, Jeremy Clements, and Ryan Sieg. Austin Dillon will start the main in 2nd because he had a faster qualifying time compared to Erik Jones, who won the first heat. Finishers of this heat race will lineup on the outside of the feature in even-numbered starting positions. Ty Dillon and Daniel Suarez, being the top 2 XFINITY regulars in the heat, will join Erik Jones and Justin Allgaier in running for the Dash 4 Cash bonus in the main. 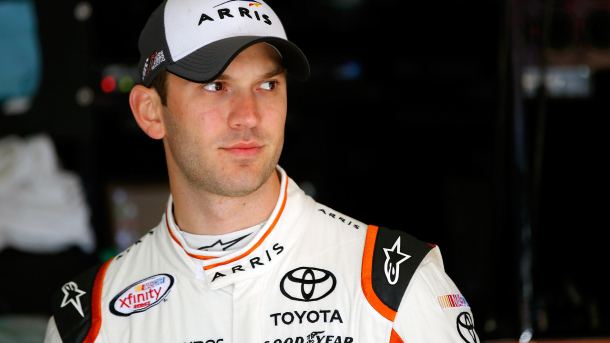 Daniel Suarez, with a lap speed of 181.902 MPH, was the quickest Friday afternoon in the second 2016 NASCAR XFINITY Series (NXS) practice session for Saturday’s NXS Heads Up Georgia 250 at Atlanta Motor Speedway (AMS). 2010 series champion, Brad Keselowski (179.406 MPH) was sixth-quickest, while Justin Allgaier (179.047) was seventh, Ty Dillon (179.035) eighth, Jeremy Clements (178.735) ninth and Ryan Reed (178.666) rounding out the top-10 quickest drivers. The teams will have their “Happy Hour” (final) practice from 2:30 p.m. – 3:55 p.m. (ET) this afternoon, and television coverage provided by FOX Sports 1. Early Saturday morning at 8:35 a.m. ET 0n FOX Sports 1, the teams will have their qualifying session to determine the starting lineup for the afternoon’s race. Greg Biffle is the current series qualifying track record holder at AMS with a lap speed of 192.300 MPH – which he set on Oct. 25, 2003. The 25th annual Heads Up Georgia 250 is scheduled to get underway around 1:50 p.m. (ET), and FOX Sports 1 will provide television coverage of the event. Matt Crafton continued his NASCAR Camping World Truck Series (NCWTS) leadership position in Friday night’s WinStar World Casino & Resort 400 (k), as he started second, leads the most laps and ends with a victory burnout at Texas Motor Speedway. 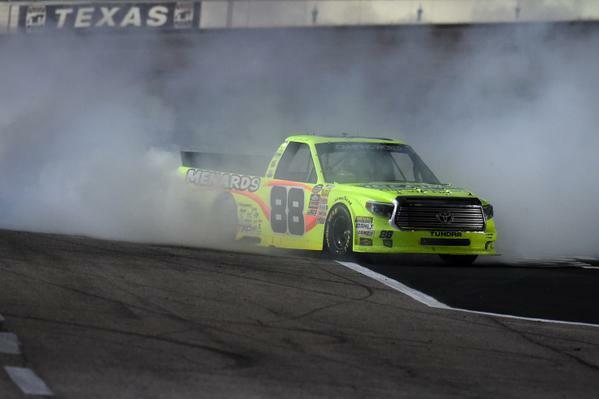 Crafton, who dominated 77 laps of the 167 that were run, received his third series win and seventh top-10 finish of the 2015 season, his eighth series career win and his second series win at Texas Motor Speedway. 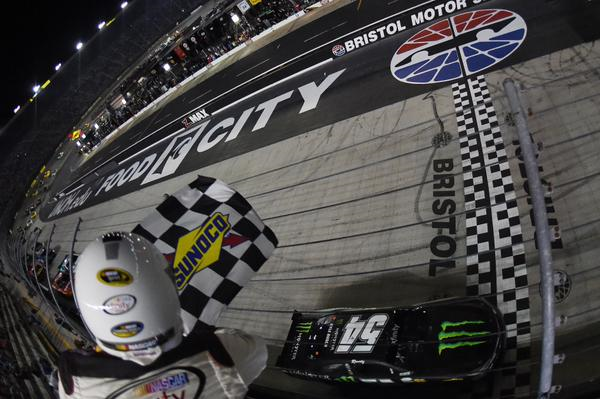 Following Crafton – by 0.569 seconds – to the drop of the checkered flag was Daniel Suarez, and they were followed by John Wes Townley finishing third, Johnny Sauter fourth and series Rookie of the Year (ROTY) contender, Austin Theriault finished in fifth. Rounding out the top-10 finishing positions were Joe Nemechek bringing home sixth, ROTY contenders Cameron Hayley, Justin Boston and Daniel Hemric finishing seventh, eighth and ninth respectively, and Ben Kennedy takes 10th-place. With his victory, Crafton leaves Texas with a 25-point lead over Tyler Reddick – who finished 11th. Time of Race: 1 Hrs, 51 Mins, 50 Secs. Next Up: The Drivin’ for Linemen 200 at Gateway Motorsports Park on Saturday, June 13th, with an approximate starting time of 8:50 p.m. (ET), and television coverage provided by FOX Sports 1. 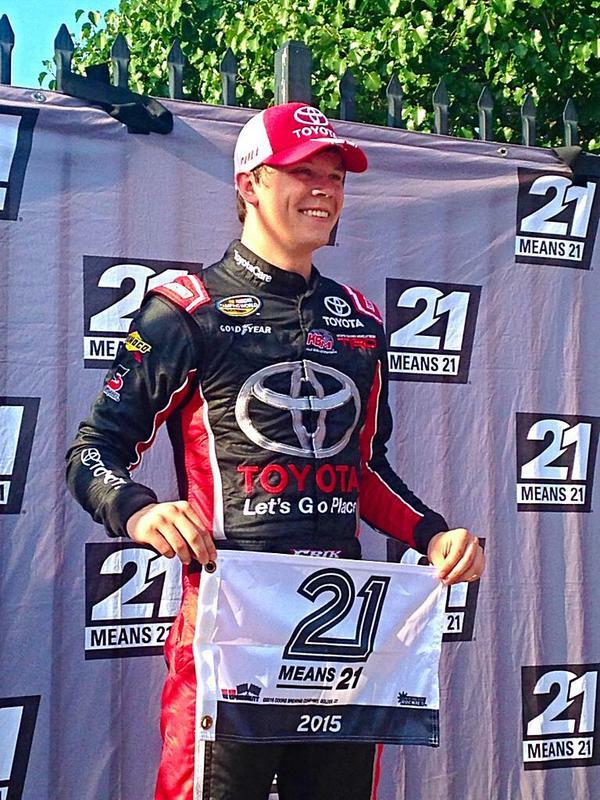 Early Friday evening at Texas Motor Speedway, it was NASCAR Camping World Truck Series (NCWTS) Rookie of the Year (ROTY) candidate, Erik Jones – with a qualifying lap speed of 181.074 MPH – winning the pole for tonight’s NCWTS WinStar World Casino & Resort 400(k). This was Jones’ second series pole and seventh top-10 start of the 2015 season, his fourth series career pole and his first series pole in No Limits, Texas. Reigning series champion, Matt Crafton, will start second on the outside pole with a qualifying lap speed of 180.379 MPH, and he will be followed by Daniel Suarez (179.886 MPH) starting third, Johnny Sauter (179.456) fourth and John Wes Townley (179.087) starts fifth. 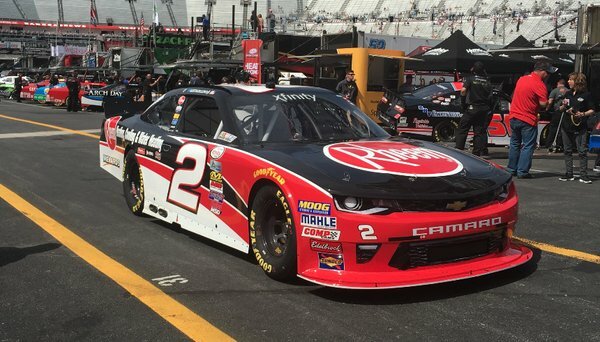 ROTY candidate Austin Theriault (178.802 MPH) will start from sixth, while Timothy Peters (178.725) starts seventh, ROTY candidates Cameron Hayley (178.247) and Daniel Hemric (178.030) starting eighth and ninth respectively, and veteran driver Joe Nemechek (177.427) will start from 10th. With only 30 drivers attempting to fill the 30-truck field starting lineup, no one failed to make the race. The 19th annual WinStar World Casino & Resort 400(k) is scheduled to get underway around 9:20 p.m. (ET) tonight, and FOX Sports 1 will provide television coverage of the event. 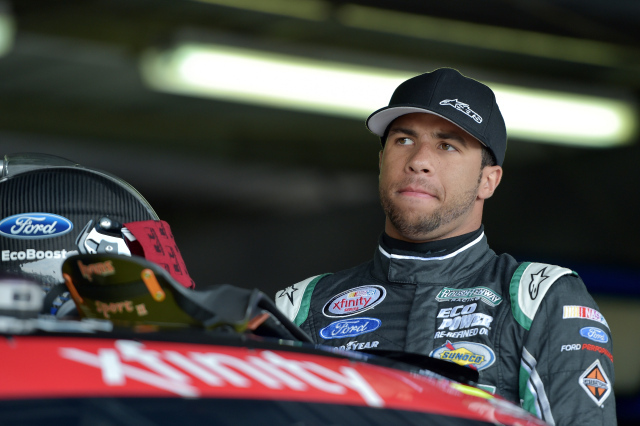 NASCAR XFINITY Series (NXS) Rookie of the Year (ROTY) candidate, Darrell “Bubba” Wallace Jr. – with a qualifying lap speed of 153.991 MPH – captured the pole for today’s NXS Buckle Up 200 at Dover International Speedway. This was Wallace’s first series pole and sixth top-10 start of the 2015 season, his second series career pole in 18-races and his second series pole at Dover International Speedway. Chris Buescher, with a qualifying lap speed of 153.886 MPH will start second on the outside pole, and he will be followed by Matt Kenseth (153.715 MPH) starting third, ROTY candidate Daniel Suarez (153.597) fourth and Brian Scott (153.394) starts fifth. Rounding out the top-10 starting positions will be Erik Jones (153.329 MPH) starting from sixth, Kasey Kahne (153.068) seventh, Austin Dillon (153.009( eighth, Ryan Blaney (152.905) ninth and Regan Smith (152.788) will start 10th. With only 40 drivers attempting to fill the 40-car field starting lineup, there was no one failing to make the field. The 36th annual Buckle Up 200 is scheduled to get underway around 2:50 p.m. (ET) this afternoon, and television coverage of the event will be provided by FOX.